Is your to-do list stressing you out? At one time you were excited about everything you put on your list. But now, somehow, your list is littered with… just stuff. You may not even know why some of the stuff you committed to doing is on your list! There’s so much to do! Your list is driving you forward, but driving you where? If you’re not careful, overwhelm can set in and start sapping your energy and excitement. There are a million productivity and prioritization techniques to help you march down your to-do list more effectively. Unfortunately, these techniques help you get more stuff checked off but aren’t geared towards reducing your stress as you work, especially not if your list tends to grow by two items for every one you check off. Here’s the reality: the only way to stop your to-do list from stressing you out is to redefine the way you relate to it. If you think this is easier said than done, read on and I’ll teach you how to think differently about your list. You control your to-do list; it doesn’t control you. It’s easy to fall into the trap of feeling like you need to do everything on your to-do list. Instead, remember your list is not carved in stone. You’re the one who put stuff on there in the first place! Some things sounded good at the time and may not sound so good anymore, and some things become less relevant the longer they have been on your list. You don’t need to complete things to cross them off. If you don’t want to do them anymore and are okay with the consequences of not doing them, then just cross them off and release them. It is not failure to change your mind. A great example is a book you started reading that you just aren’t that jazzed about finishing. It’s been on your to-do list to finish it for a long time and you’re not moving onto to other books because you haven’t finished the first book yet. There’s no rule that says you have finish it. Cross it off and move onto the book you’re more interested in today! Why bottle yourself up behind an unconscious commitment that doesn’t serve you? 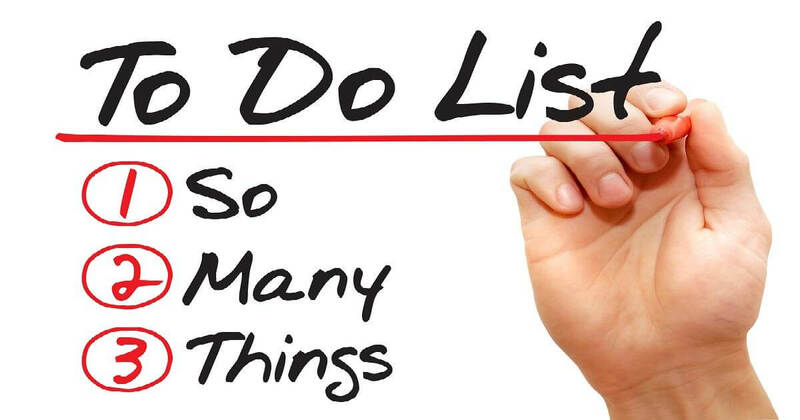 Sometimes you may put things on your to-do list like “make grocery list”, “stop at store”, “cook dinner”. If you’re coming home late from work after a long day and just don’t feel like doing that stuff, this is why delivery was invented. Sure, it might be a bit more expensive, but wouldn’t it feel good to cross all three of those items off at once without doing them? Asking for help is an alternative, as well. It’s entirely possible you over-committed to something. Rather than letting it stress you out and possibly lead to a failure, wouldn’t it be better to ask a co-worker, friend, or family member for help? People actually like helping out when you’re humble enough to ask. It’s their opportunity to make a positive contribution in your life! I was raised to do my homework and chores before playing my video games, which, as an adult, somehow got translated into “check off everything on your to-do list before you relax.” The only problem is that there is always something on my to-do list. And frankly, there always should be. If I put things I want to do on my to-do list, I’d certainly hope there’s always something I want to do! Life is always moving. There will always be chores. There is no such thing as to-do list zero. Once I realized that, I was able to relax and take some time off without guilt. I’ll confess I’m so Type A that I’ve completed a task I hadn’t put on my to-do list and then added it just so I could have the satisfaction of crossing it off. To me crossing things off feels good. Completions feel good. Moving forward in life feels good. Remember this when you put tasks on your to-do list. Each one is an opportunity to celebrate a completion by crossing it off. Don’t worry about the length of your list; it’s all just opportunity to move forward! Your to-do list is a place to dump things out of your head so you don’t have to remember them. We all have a lot of thoughts and responsibilities. If we had to remember them all we’d end up stressing quite a bit about forgetting some of them. Instead, get in the habit of putting your to-do items on your list immediately when you think of them. Then, instead of remembering all the stuff you have to do, you just have to remember to do one thing repeatedly: check your to-do list. At any given moment I have all sorts of things on my to-do list: books to read, errands to run, chores to do, work tasks to accomplish, creative projects to work on. Build a robust to-do list with plenty of variety. Sometimes you’re in the mood to go work out; others you’re in the mood to throw on a podcast and do the dishes. Each time you have a free moment your to-do list will remind you of all the different options you have. In this case, you’re better off having a longer list! Ultimately, your to-do list is nothing more than a tool to help you remember what you want to accomplish during the day. You don’t work for it; it works for you. Like a hammer, it can be very effective at its job; however, if you get careless, hammering your thumb hurts. By staying mindful of how you’re relating to your to-do list, you can make sure it’s doing its job rather than getting out of control and hurting you accidentally.